I was out walking my dog this morning when I had to find a dumpster. The dog had completed his task for the morning, and I had dutifully–an ironic term there, I suppose–picked it up in a plastic bag. Disposing of it in a dumpster was a necessary prerequisite for returning home and giving him his treat. Every dog owner knows this routine. After disposing of the dog’s business, I spied a penny on the ground in the alley. More than half the time I see a penny on the ground, I pick it up and look at the date stamped on it. It’s given me food for thought on several instances, such as with 1995 and 1968 and 1986. There are a few others, but I don’t want to take away from today’s find more than I have to. Because 1983–the year stamped on today’s penny–was a pretty significant year for me. 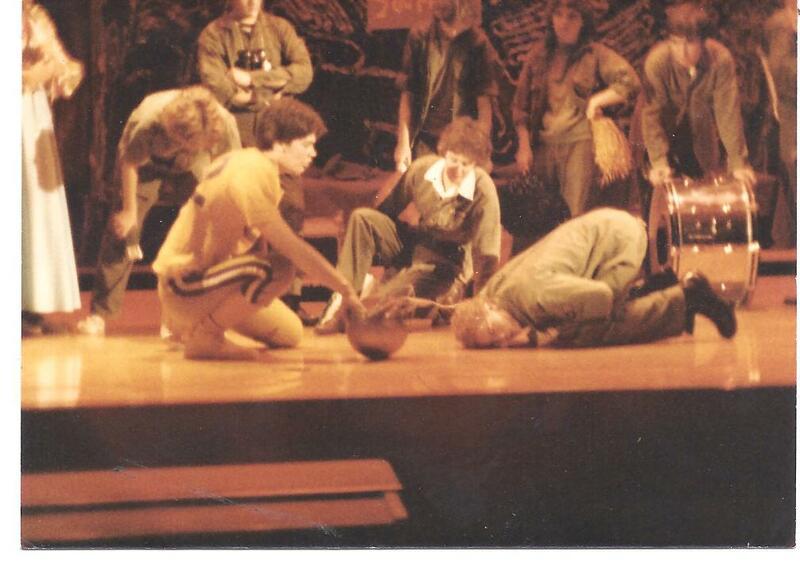 In the fall of 1983, I tried out for the school play. I was a sophomore in high school, and wanted to try my hand at acting. It’s not clear to me today why I did it, because I was an awkward and shy kid at that stage in my life. What made me want to get on stage and recite some lines is something I still don’t fully understand. I got a small part, a General of some sort, who had maybe two or three scenes in the show, which was M*A*S*H. The final episode of the TV show inspired by the play had aired earlier in the year, and the juxtaposition of these two was probably not a coincidence. “Suicide is Painless,” the haunting theme song for the show, was played as we came onstage to take our curtain calls at the performances. I’ll always have fond memories of being in that show, and regret that I never seriously thought of acting again after this show. But the things you didn’t do in life cause more regrets than the things you did do, and I understand that now. Not so much when I was fifteen, though. The big moment of this play, and the reason I’m typing this out today, is because of the director of the play, Brother Vince. He was a rather heavy-set guy who was something of a priest-in-training. He spent one year at my high school, and was my religion teacher. He also decided to direct a play, so at least I knew who the director was. I doubt I would have tried out for the show, otherwise. I wasn’t a football player–which is what everyone wanted to be at my school–and my parent-imposed exclusion from the jock culture left me to explore other options, instead. I started writing for the school newspaper, which I enjoyed a lot, but I wanted something else to go along with it. And the school play seemed to be a good outlet for it. Three decades later, both of my daughters are in every play they can find, and I think of this as carrying on whatever it was that I once did, but to a degree I never thought possible. And I’m so proud of them for doing this. But back to M*A*S*H for a moment. I attended an all-boys high school, but the girls from the all-girls school up the street also auditioned for the play. I wanted to be around the girls, as any hormonal teenager would, so being in the play gave me a chance to admire them from afar. No way did I have the confidence needed to actually speak to any of them. But being in their presence was enough for me, at that stage of my life. I had learned my lines for the part I had, and one day the director, Bother Vince, offered me the role of Trapper John. It was one of the meatiest roles in the play, and the guy who was originally given the role–a junior who also played on the school soccer team–either quit the play or was made to decide between the team and the play. The latter option had never occurred to me before today, and what the true story is I’ll likely never know. I knew that this role offered more stage time, which I wanted, but would entail having to learn a lot more lines than I already had. I didn’t want to let my director down, but I was hesitant to take on the added responsibility. I finally agreed to take the part, because I reasoned that the offer would not have been made unless he thought I could handle it. I took it as a vote of confidence, and I accepted the challenge that came with it. I learned the part, and found myself tremendously emboldened by the experience. The soccer team’s season ended a week or two before opening night, and the guy who had the Trapper John role may have wanted to reclaim his old part. It was never asked of me to relinquish the part, and I don’t know what I would have done if this had happened. In my mind, it was my part, because I had put in the time to make it so. And so it was, when the curtain went up on a weekend in early October of 1983. Acting gave me a sense of self-confidence, which is something I had never had before. When I was on the stage, everyone in the audience was looking at me, and hearing my voice. For a kid who had spent his life seeking out the shadows at every opportunity, this was an elixir of a kind I had never yet known. A great thing happened to me, some 32 years ago. I found a sense of confidence that needed some discovery and some nurturing to fully reveal itself. Whatever happened to Brother Vince after that year, I have no idea. But his decision to stage a play, and to offer me a bigger role than the one I originally had, and then stick with me through to the end, is something that I’ll always be grateful for. My older stage diva needs a ride to her college class, so I better wrap this up. But I’ll see her on stage again before too long, and I’ll be sure to think of Brother Vince when I do.